Expert installation. By choosing an experienced insulation contractor to install spray foam, you can ensure that you are getting the best R-value and long-lasting performance. With everything there are advantages and disadvantages; this is no different with Sprayfoam Insulation. In this section, we are addressing negative comments that have been associated with sprayfoam insulation. Each of these are legitimate claims with sprayfoam, and they need to be addressed and not shied away from. "I read someone had a Bad mixture installed in their house that resulted in undesirable foam with a bad r-value and caused shrinking or cracking." Yes, bad mixtures do occur when you have untrained people trying to make foam as a side job. You can have peace of mind that Icynene leads the way in choosing professional installers who are properly trained and certified. The Icynene name has become synonymous with quality and professionalism. When foam is mixed and sprayed correctly to manufacturer’s specifications there is no worry in the foam shrinking or cracking. This should never be a problem with an experienced, trained and certified applicator. This is why Icynene stands behind their product with a LIFETIME WARRANTY. "I heard spray foam was way too expensive generally costing two to three times as much as fiberglass." Yes, sprayfoam is more costly up front than traditional methods of insulation and so is a corvette compared to a chevette. 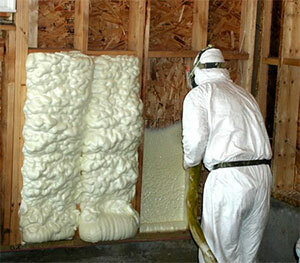 This is a funny way of describing the difference in performance of foam compared to traditional methods of insulation. The good news is that on average in a new home you will recoup the additional money spent over fiberglass in as little as 4 years. Since Reed's Sprayfoam Insulation is a large dealer and buys in bulk we have found that in some cases the payback could be even sooner. "Someone told me that my house will be too tight." Yes, sprayfoam does make a home “tight”, but the old methods of having a leaky house is no longer acceptable. That’s why the motto among building professionals is BUILD TIGHT, VENTILATE RIGHT. New home builders are concerned with air sealing to create a “tight” building and they want to maximize both energy efficiency and indoor air quality. The accepted findings of the building science community are that it’s not possible to build a home too airtight for energy efficiency but that ventilation options must be considered. A home insulated with Icynene sprayfoam insulation will typically experience an exchange of air every 5 to 10 hours which can be contrasted to an existing home’s (over 20 years old) exchange every 90 minutes. The reduction in energy load requirement and the increase in comfort and indoor air quality, with the improvement in air tightness are significant. The option of leaving the house leaky is not viable, as the primary ingress points are the attic and basement or crawlspace – not very conducive to indoor air quality. Balanced ventilation using either an ERV or HRV unit.